The organization I just left is struggling with this very subject. And it will be a problem that we see more and more. So it was nice to see the problem and a workaround succinctly described in one place. Nicely done. Thank you for this. We really needed a way to do wireshark capture in the VM environment. Great job and good instructions! I’d very much like to see some details on this. Is this in general, or just VMWare/Virtual specific? It is a general problem and happens on physical as well as on virtual machines. I’ll try to do a post about this as soon as possible. Thanks for this. Was having a nightmare getting wireshark on a VM to actually capture any traffic coming in the mirrored port I had set up. I already had it in its own Port Group and just needed to active Promiscuous Mode. Hello, I am using VMWare with the latest version of Kali Linux . Hen I run the wiereschark intarface responds to myself that I must be super user to use the tool. Must monted virtual machine administrator right ? 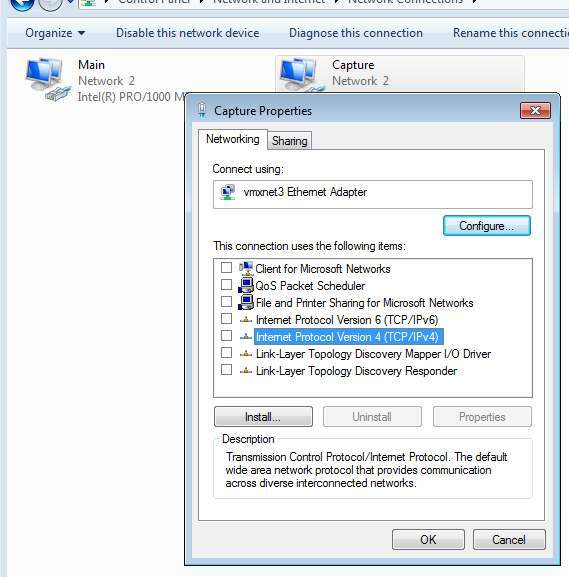 Hi,would like to know how we install wireshark in server 2003 on esxi host,I am unable to get the network connectivity in my server 2003 in esxi.I have 10 CSR 1000v instances on whom I want to capture the packets and the 10 machines alongwith the server 2003 VM are in the same port group. Not sure about the 1000v, but as far as I know you should be able to configure SPAN ports like on a physical Cisco switch. So you’d create a monitor session with source being all the ports you want to monitor and destination the port of the monitoring VM. Unfortunately I have no 1000v so I can’t test this. We have RSPAN setup to a destination port on Switch 1 port 2. Our ESX hosts are plugged into the same switch. 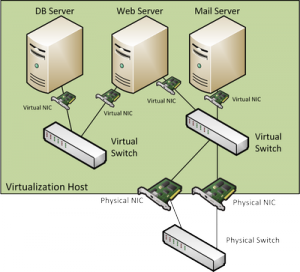 We need the SPAN traffic to go to a virtual NIC on a VM that resides on the ESX host(s). I have problem to capture XML packet i follow the steps its working fine great article. Terrific article! Now I can have an informed discussion with our VMWare admins, instead of having to blindly accept their objections! Thanks a lot. .successful! !! 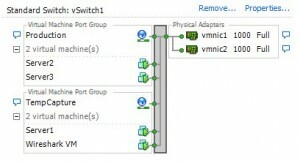 Is there any reason not to just leave the new Port Group on the VMWare host for future use. I tried what you explained in your article but I cannot see all the traffic on the monitoring VM. 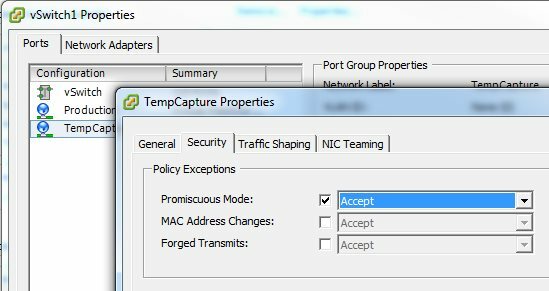 I have created separate port group with promiscous mode set to accepted. Moved the 2 VMs in there but I’m not seeing all the traffic of the VM I want to analyze. Should wireshark be configured a specific way? Never mind. Somehow the portgroup changed back to its default settings after moving the second VM into the portgroup. So it does work. I’m implementing MS ATA right now and it requires forwarding the DC traffic to the ATA server. Both virtual. This setup would be permanent. Will this work in this situation? It should work, without really having an idea of what your setup looks like. Just make sure that the packets pass where you put your capture VM. I’ve got 2 ESXi physical servers, box 1 and box 2. I’ve got Security Onion installed on box 1 with promiscuous mode enabled. It sees and captures the traffic on the interfaces in it’s Virtual Port Group just fine. I’ve got a second ESXi box connected by the Physical Nics and I have it’s Virtual Port Groups also enabled for promiscuous mode. Traffic does flow between physical boxes over the Nics, but my sniffing VM on box 1 does NOT capture any traffic on box 2. Is there a workaround for this? I want my sniffer VM to live on box 1 so it isn’t using box 2 resources. Unfortunately, no. Sniffing almost always requires the sniffing VM and traffic being on the same box. A rare exception is when you can use distributed switches (Enterprise Plus feature set) which can to ERSPAN, which forwards packets via a special VLAN. Port group sniffing requires the sniffer to be on the same box as the traffic. I have this setup as described but all I see on wireshark is the broadcast/multicast traffic. Looks like the wireshark port doesn’t see the unicast traffic between the 2 VMs that I want to capture. And I set the portgroup and wireshark port to promiscuous mode. Thanks for any insight! Are the two VMs on the same ESXi host as the capture VM? Otherwise it won’t work, not even with a distributed switch via SPAN port. Good point, I’ll move them to the same host. Thanks! You’re welcome, and I’ll update the post accordingly since that requirement wasn’t made clear so far.